The U.S. Food and Drug Administration has been regulating the salt content used in product manufacturing along with making consumers aware of the nutritional content in various foods. Low-sodium solutions offered by sodium reduction ingredient manufacturers evolve according to end-use applications. This report estimates the size of the global market in terms of value. 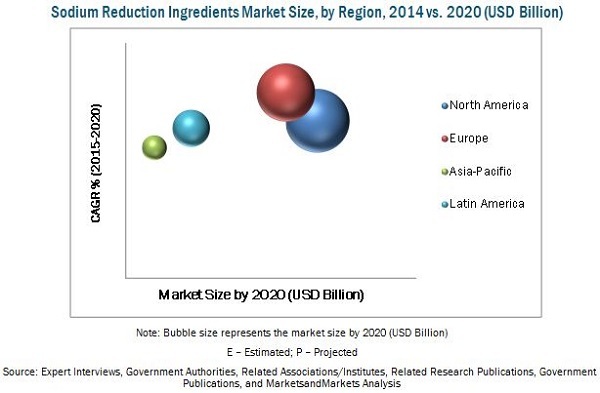 The market for sodium reduction ingredients is projected to grow at a CAGR of 11.2% to reach USD 1.24 Billion by 2020. The market was dominated by the North American region in 2014 where the U.S., Canada, and Mexico were the leading countries in 2014. Drivers, restraints, opportunities, and challenges of the market are also discussed in detail in the report. In the next five years, mineral salts are projected to gain better prospects as the fastest-growing segment in various regions. The application of sodium reduction ingredients is projected to witness strong demand from bakery & confectionery and meat products industries. This report provides a complete analysis of key global players in the sodium reduction ingredients market, with a clear insight on developments, trends, and their product portfolio. This report includes the profile of the leading players of this industry such as Cargill, Incorporated (U.S.), Kerry Group Plc (U.K.), Royal DSM N.V. (Netherlands), Angel Yeast Co. Ltd. (Japan), E.I. du Pont de Nemours & Co. (U.S.), and Innophos Holdings Incorporated (U.S.). Due to the tremendous opportunities in the market, the business segments and product portfolios of these companies have been undergoing a significant shift to be organized into a structurally and strategically strong market force. The current competitive scenario of this market provides valuable inputs that can validate the strategic decisions to be employed in the future by sodium reduction ingredient manufacturers. 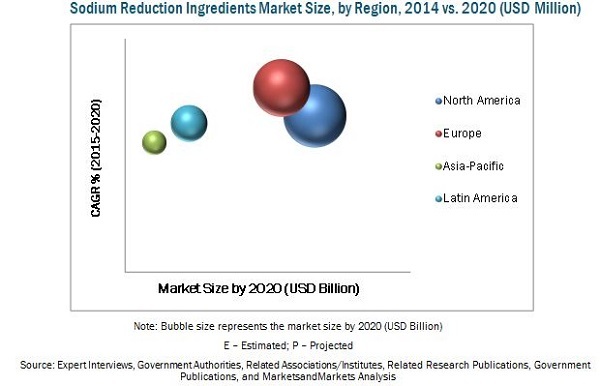 Companies engaged in the development and marketing of sodium reduction ingredients portfolio comprising mineral salts, amino acids, and yeast extracts can avail a concrete view about the market structure in key countries. The report projects the analytical and qualitative requirements for important stakeholders, such as packaged food manufacturers & traders, flavor formulators, specialty food manufacturers, and processed meat industries involved in the sodium reduction ingredients market. This research study categorizes sodium reduction ingredients on the basis of type, application, and region. The sodium reduction ingredients market is projected to reach USD 1.24 Billion by 2020, at a CAGR of 11.2% from 2015 to 2020. The market for sodium reduction ingredient products has a significant impact on the nutritional food and health care sectors. Sodium reduction ingredients are broadly categorized based on their type into amino acids, mineral salts, yeast extracts, and others including hydrolyzed vegetable protein, trehalose, and nucleotides. The sodium reduction ingredients market is also segmented on the basis of application into dairy & frozen foods, bakery & confectionery, meat products, and sauces, seasonings & snacks, and others that include breakfast cereals, baby foods, and beverages. Sodium reduction ingredients are used in the food & beverage industry to reduce the sodium content in the daily diet. The hazards related to a high-sodium diet such as high blood pressure and hypertension have been documented widely in the past decade. They are common risk factors associated with cardiovascular diseases (CVDs). The existing companies in this market are actively introducing new products with different ingredients and flavors. The demand for sodium reduction ingredients is expected to increase in the near future due to health-related concerns and the rising global population. The market in North America is projected to reach nearly USD 536.50 Million by 2020 and is expected to remain as a strong market along with Europe. The North American region accounted for the largest market share in 2015; however, Europe is projected to be the fastest-growing market during the forecast period. The global market of key developing regions such as Asia-Pacific and the Middle East witnessed the entry of important market players, business units, and research centers of key players. The key players in this market have been involved in the process of developing a range of customized solutions to target specific needs of the food manufacturers and consumer health. Thus, the sodium reduction ingredients market has been gaining more global presence and acceptance among authorities. Leading participants in this market include Cargill, Incorporated (U.S.), Kerry Group Plc (U.K.), Royal DSM N.V. (Netherlands), Angel Yeast Co. Ltd. (Japan), E.I. du Pont de Nemours & Co. (U.S.), Innophos Holdings Incorporated (U.S.), and Jungbunzlauer AG (Switzerland). These players have been implementing different strategies to achieve growth and development in the global market. Investments on the development of new innovative products and capacity expansions exhibit the strong competition to capitalize on the potential market demand for sodium reduction ingredient products. 12.4 Angel Yeast Co. Ltd.